Figure 1. Design of the heterostructure. 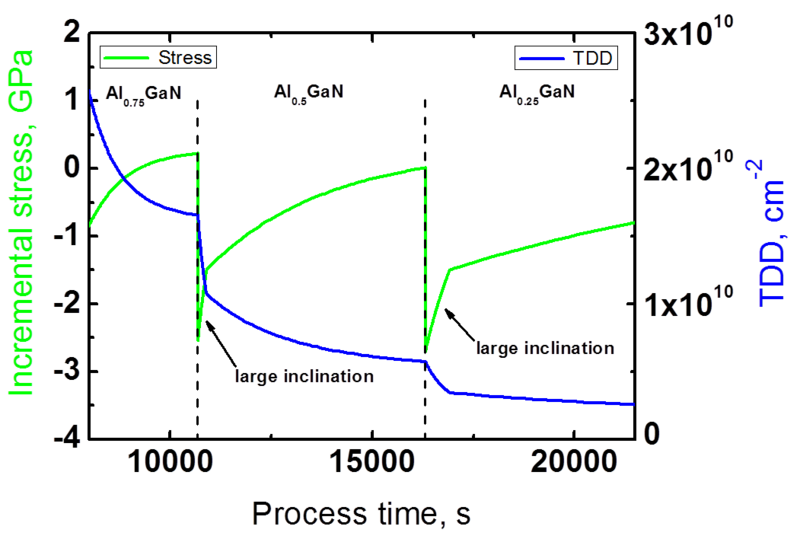 STREEM AlGaN is a specialized software tool for self-consistent modeling of the evolution of stress and bow, as well as dislocation dynamics during the growth and cooling of (0001) III-Nitride heterostructures by MOCVD on silicon and sapphire wafers. Figure 2. Comparison of calculated and experimental curvature evolution: (1): AlN nucleation layer; (2): AlGaN graded buffer; (3): thick GaN layer; (4): AlN interlayers; (5): cooling. 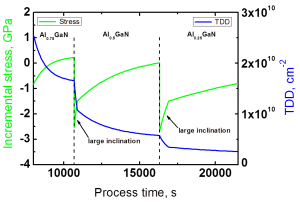 To predict relaxation of compressively stressed (Al)GaN layers, original kinetic model has been developed, attributing relaxation to nucleation and inclination of threading dislocations depending on the process conditions and stress state. For accurate modeling and analysis of the curvature it is important to know vertical thermal drop through the wafer. 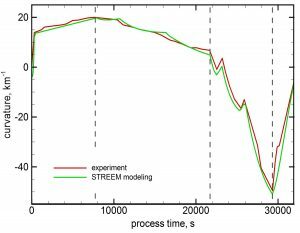 STREEM-AlGaN allows one to estimate the balance of convective, conductive, and radiative heat exchange, depending on the reactor type and process parameters, from the in-situ measured temperature. As a result of the modeling, the user can analyze such characteristics as the stress, curvature, bow, effective lattice parameter, and temperature gradient across the wafer as well as the density and inclination angle of threading dislocations across the heterostructure. By adjusting the recipe parameters, including the temperature, thickness and composition of the layers, sequence and durations of the particular stages of the process, user can follow the respective changes in the above characteristics and establish correlations between the recipe and properties of the heterostructure. Experiment: B. Krishnan et al., Sensors and Materials 25 3 (2013) 205. Figure 3. Detailed view of stress and threading dislocation density evolution during growth of the graded AlGaN buffer. 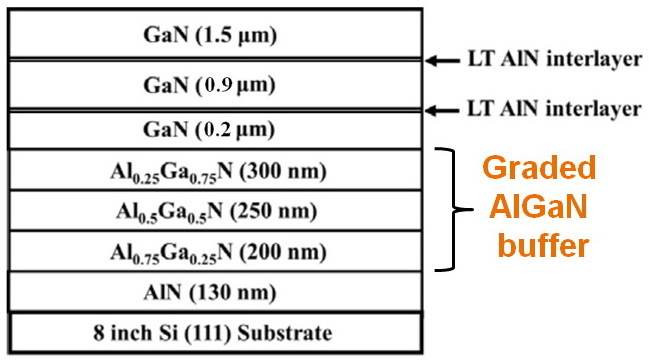 This example case deals with device-oriented GaN layers that have been grown with AlxGa1-xN buffer structures as a bottom layer on 8″ Si substrates in a vertical high-speed rotating-disk MOCVD system, Figure 1. The software is able to predict reasonably well the curvature evolution in the heterostructure, including graded AlGaN buffers, thick GaN layers, and the cooling stage, see Figures 2 and 3. 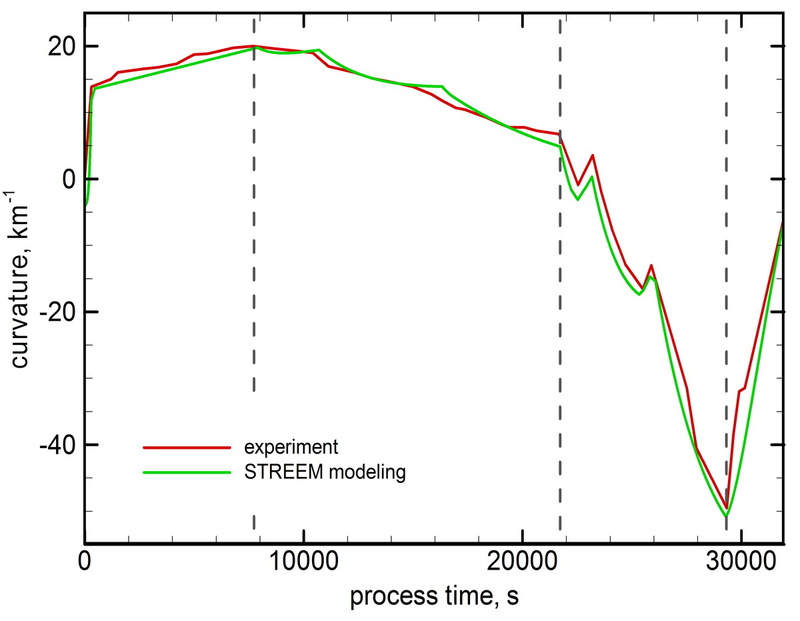 The growth procedure starts with the AlN nucleation layer (NL) whose stress state is not modeled directly, but the respective mismatch relaxation degree can be found via processing of in-situ curvature data. In this case, the threading dislocation density at the first AlGaN/AlN interface remains the only required parameter. Combined with the mismatch relaxation degree in the NL it can serve as the basis for all the subsequent strain engineering work related to heterostructures using the same NL. This case represents one of the first examples for successful application of superlattices as dislocation filters in developing in GaN-on-Si buffer structures. 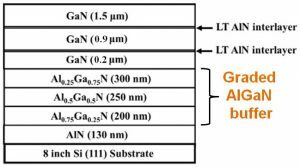 Application of AlN/GaN superlattices (SL) is another possible approach to efficiently reduce the threading dislocation density and counteract the tensile stress usually observed in the growth of GaN on Si wafers. 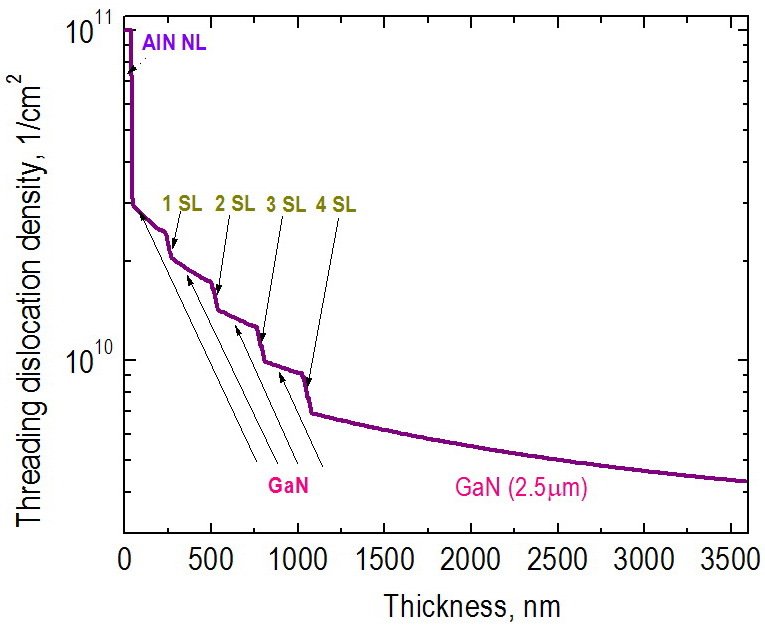 The compressive stress induced by AlN layers in subsequent GaN layers of SL results in significant inclination of existing dislocations and their annihilation, while the GaN layers do not exceed critical thickness necessary for nucleation of new dislocations. Combined, these effects result in significant reduction of the dislocation density. 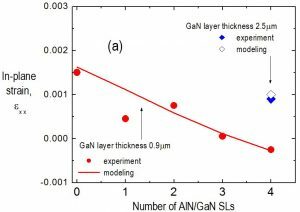 In this example, we illustrate that STREEM AlGaN can be successfully used to model TDD and stress evolution during growth and cooling of such GaN-on-Si structure with different number of AlN/GaN SLs and thickness of the top GaN layer. Figure 5. Dependence of TDD on the number of superlattices: comparison with experimental data. Figure 6. 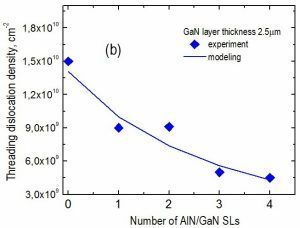 Experimental and calculated in-plane strain of the top GaN layer in dependence on the number of AlN/GaN SLs.